"I have found this program to be a great beginning and a way to rethink what we have been doing - both how to do it better and how to use information more productively, and to be proud of what we have done that is valid." The Connecticut League of History Organizations helps history museums, historical societies, historic house museums and libraries with archival collections build professionalism and ensure their programs and collections remain vibrant community resources. 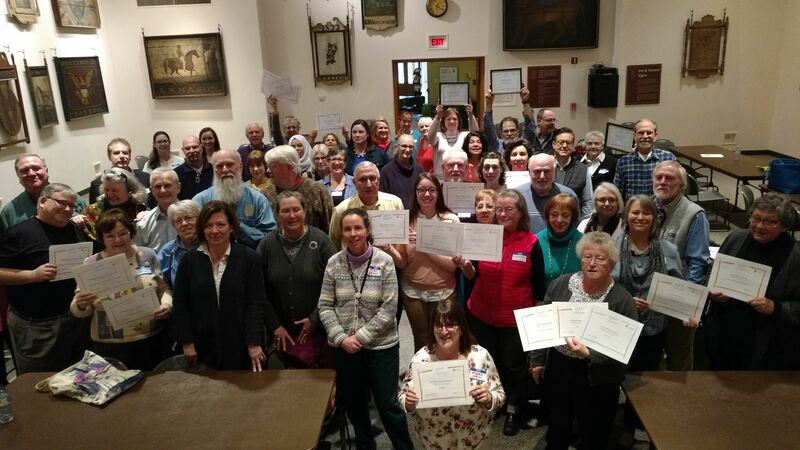 StEPs-CT, a two-year program created with Connecticut Humanities and run in partnership with the Connecticut Historical Society, guides them towards excellence in six areas of organizational practice. StEPs-CT is based on the "Standards and Excellence Program for History Organizations" (StEPs), a national model curriculum developed by the American Association for State and Local History (AASLH). We've added a series of hands-on workshops, expert mentors who are on call to help with the rough spots and a competitive granting fund to support projects related to the program. The StEPs-CT program is the first in the nation to implement the StEPs curriculum on a statewide level. StEPs-CT is a 36-month integrated program of professional development, facilitated conversation, and mentorship for smaller cultural organizations. StEPs-CT is a program of Connecticut Humanities (CTH) and the Connecticut League of History Organizations (CLHO) in partnership with the Connecticut Historical Society based upon a curriculum of best practices developed by the American Association for State and Local History (AASLH) called StEPs. StEPs-CT aligns with the national curriculum created by AASLH. The six standards sections covered over the course of two years are: Mission, Vision, & Governance; Audience; and Management (year 1) and Stewardship of Collections; Stewardship of Historic Structures & Landscapes; and Interpretation (year 2).